Japan? Just 130k total, but that doesn't include Mark III (which should be higher), for which they used a different serial number format which isn't fully understood yet. Is it software sales/shipment in the bottom part of these images? It's not possible to be that high from serial numbers, maybe the estimates could be off by a few tens of thousands at most. 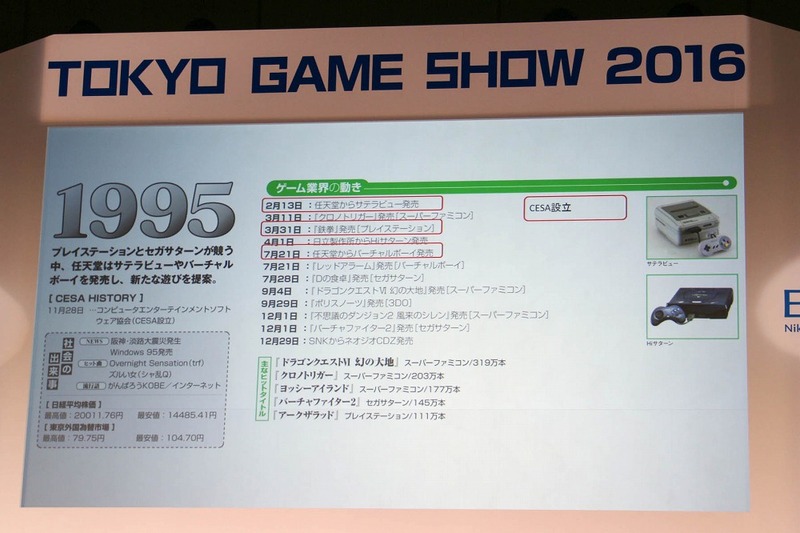 I don't think that any numbers from JP SMS or earlier models directly source Sega, so should be taken with caution. Edit again: Looks like it might be LTD sales for titles released that year, 1995 Saturn VF2 1.45m, seems a bit high for just YTD?. 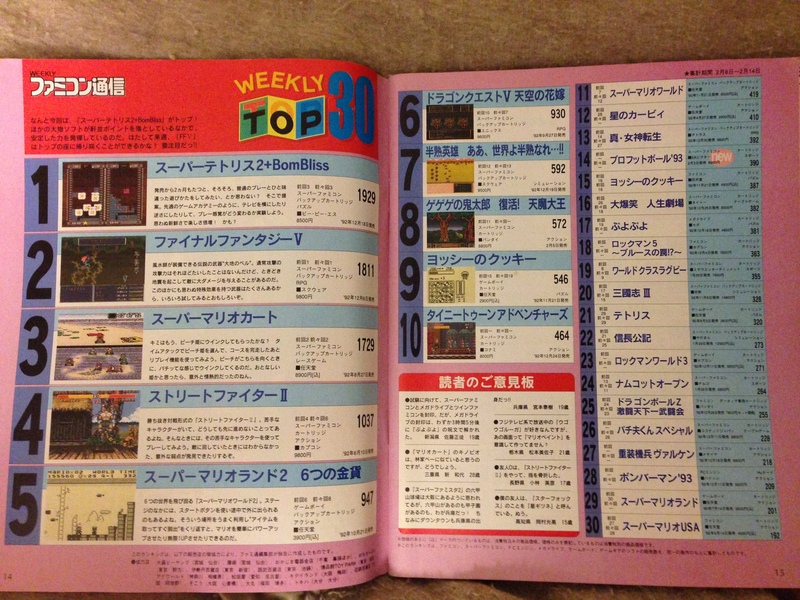 Edit again again: Yep, must be LTD sales, 1996 Mario Kart 64 is higher than the number of consoles that they had shipped through March 1997.
seeing Megami Tensei 2 in the chart on the last page has me so curious about the pre-PSX sales of the franchise. all we know for now is that Persona 1 is the best selling megaten game at 400K, but did Shin Megami Tensei beat it across all platforms? How did it do just on Super Famicom? Or PC Engine? How about the sequel? So many questions! 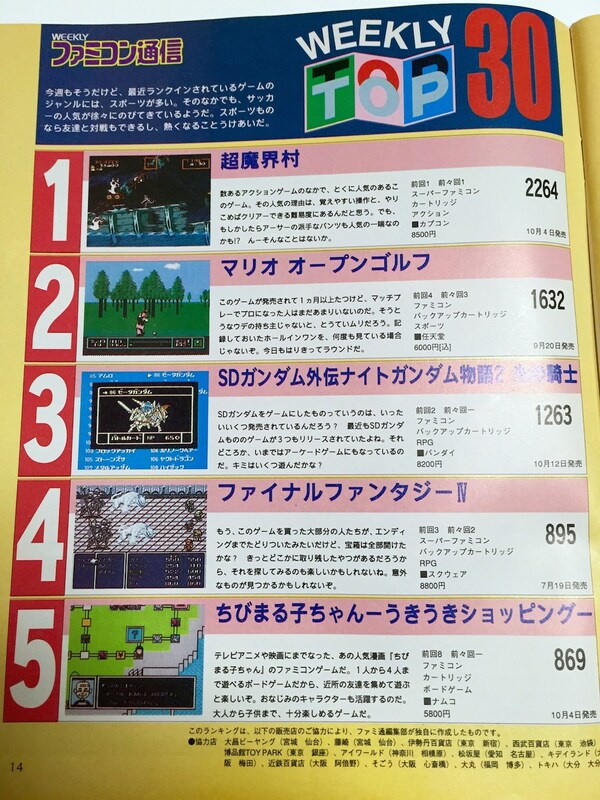 Do we have any clue where SMT1 charted on PC Engine? Wikipedia says it released Dec 25, 1993. ^we do not have that week yet, that would be the double week over the holidays. 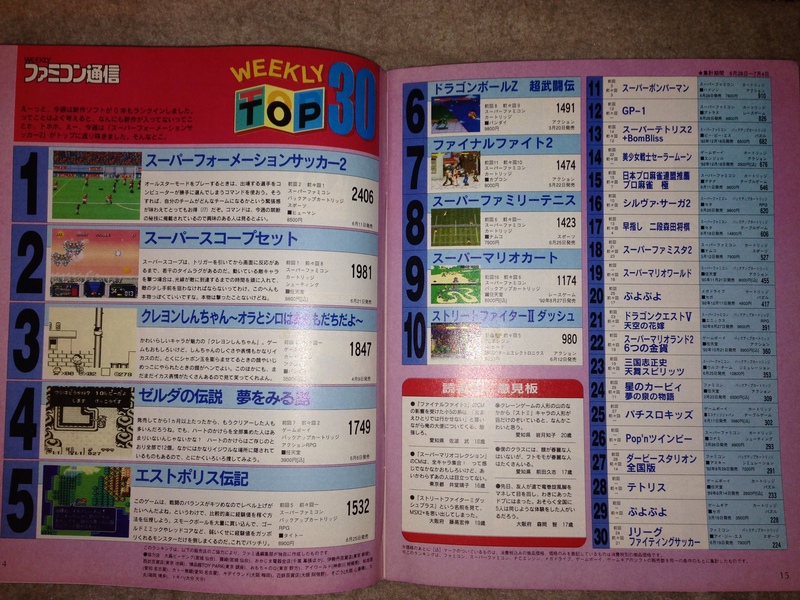 kitsunebi77 from the retromags site has been gracious enough to take shots of the top30 charts from his pre-95 issues and share them with us! A Mega Drive game at no. 1!? This might be the only one ever. projections are just that/not definite. We had just the top 5, now the full chart! Again thanks to kitsunebi77 from retromags for scanning these for us. Is there a better scan for this? Rankings for previous weeks can't be seen. Looks like part of a three set bundle each going for only $20, wow! Those bundles should cover most of 1994. I'm working on the years before '94. It's pretty easy to do this guys, just click English at the top and sign up to make purchases/bids. I would cut-and-paste: &#12501;&#12449;&#12511;&#12467;&#12531;&#36890;&#20449; into the search box and type in a year after it when doing searches. 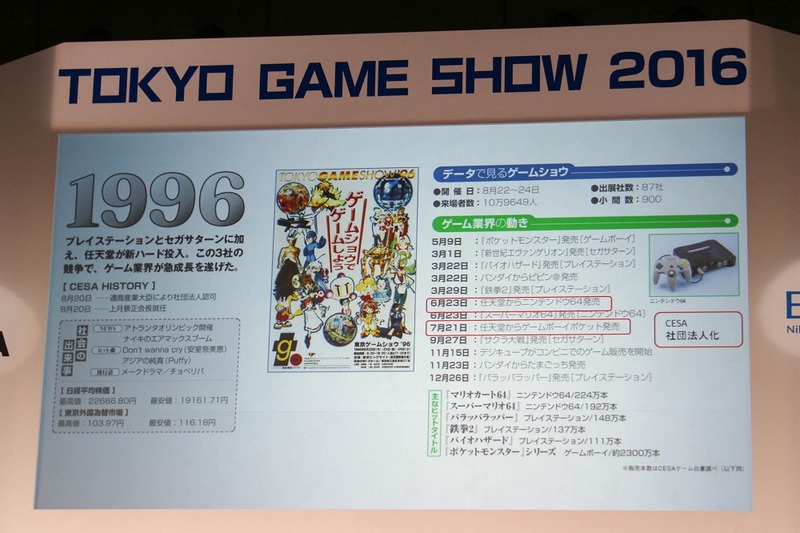 (that was the original magazine name before it was shortened to just Famitsu in '96?). Use a "snipe it now" bid for auctions and add like 5 cents/yen to the asking price. Why don't you guys order a few. BKK? Chris1964? Celine? Okami? Moor-Angol? I've spend $258.51 on issues so far, tomorrow I'll be posting the last one which just arrived. 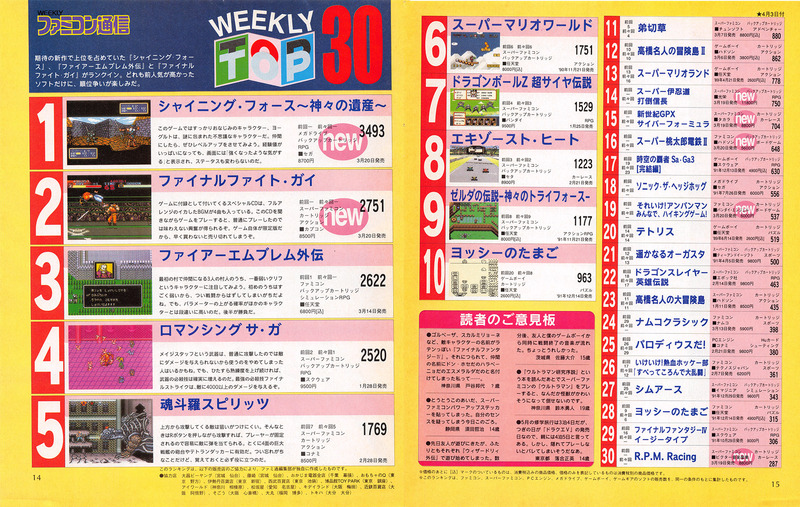 DQIV first week. Does anyone know what the best selling Genesis / Mega Drive game is, Sonic 1 or 2? Bit of confusion going on in the Sega Saturn thread. Why don't you guys order a few. BKK? Chris1964? I can't really spare the money for more magazines at the moment. I don't think Sega ever gave a breakdown by platform. Sonic 1 was heavily bundled. 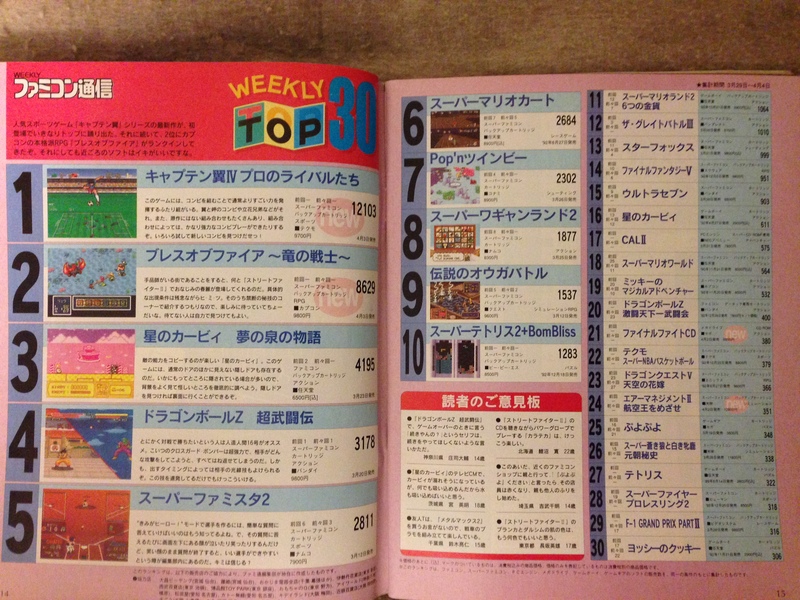 Well this article suggests Sonic 2, Aladdin, and Sonic 1 are the best selling games. All three game were bundled at various points. Right, but those numbers also include SMS and GG. 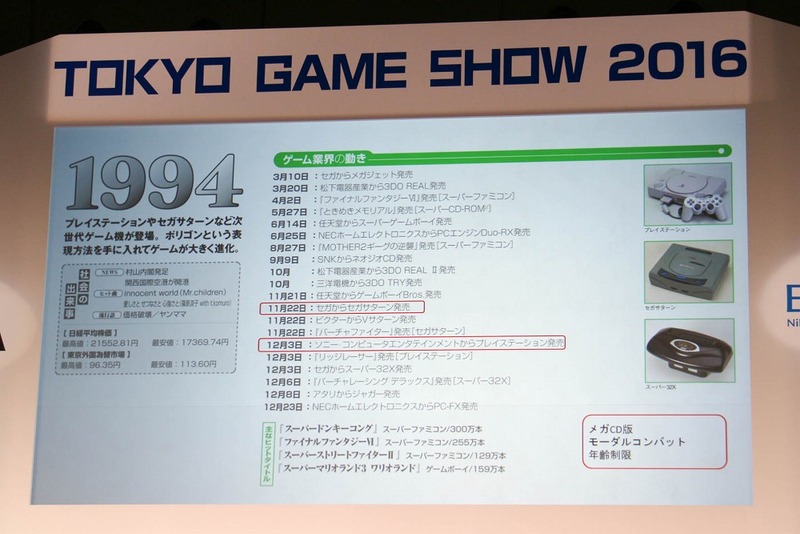 Sonic 1 was built into later SMS II consoles, ~800k units. After Altered Beast Sonic 1 was the default bundled GEN/MD game. Sonic 2 and Aladdin were never bundled to the same extent. 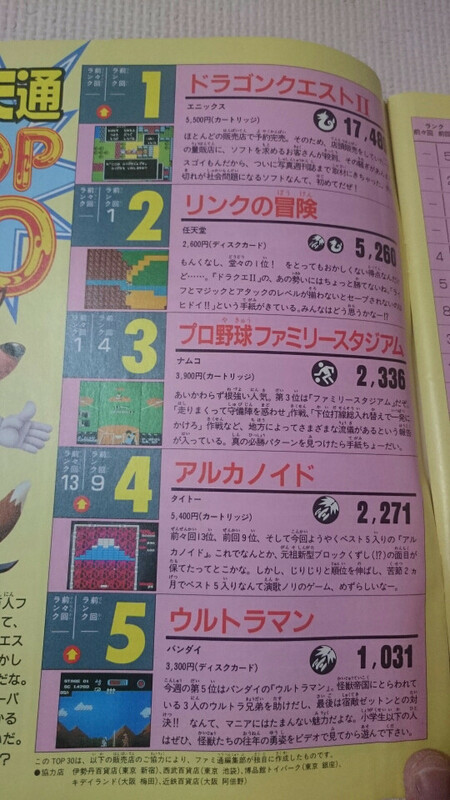 We don't know what the Sonic 1 and Sonic 2 numbers represent, or through what period, so it's not really possible to say which sold more. I'll dig up some launch period numbers for Sonic 2. Alright, sounds good. Shame Sega software sales are so vague. Though, to be honest, I wouldn't be surprised if it turned out Mortal Kombat was the best selling Genesis/Mega Drive game. Thanks for the response BKK, maybe in the future. These are incredible deals, I placed a sniper bid on the second bundle, I hope a group of us can place bids for each, either way we can win this. We can ship to Cheesemeister who's in Japan to avoid heavy overseas shipment charges and he'll scan the sales charts (he offered to do this). 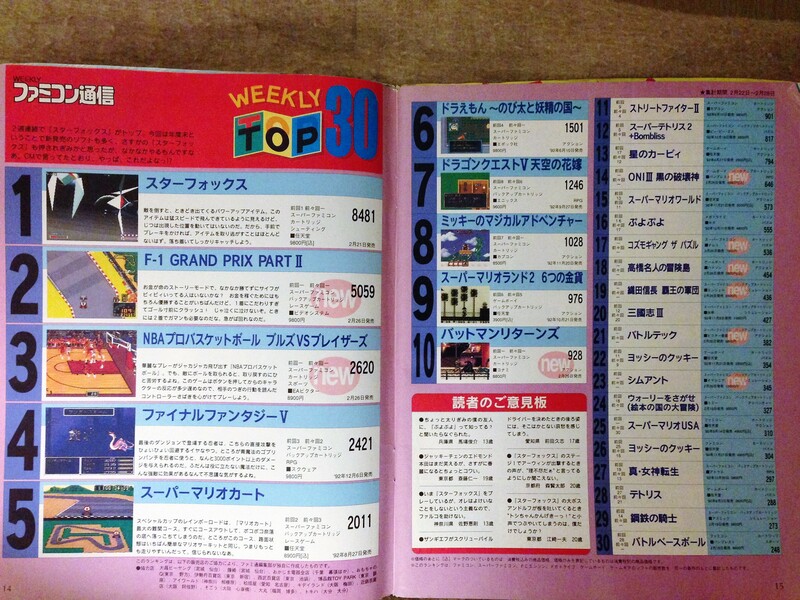 Top 30 is from issue 1991.11.15/22 (153*) and it was already translated some time ago. 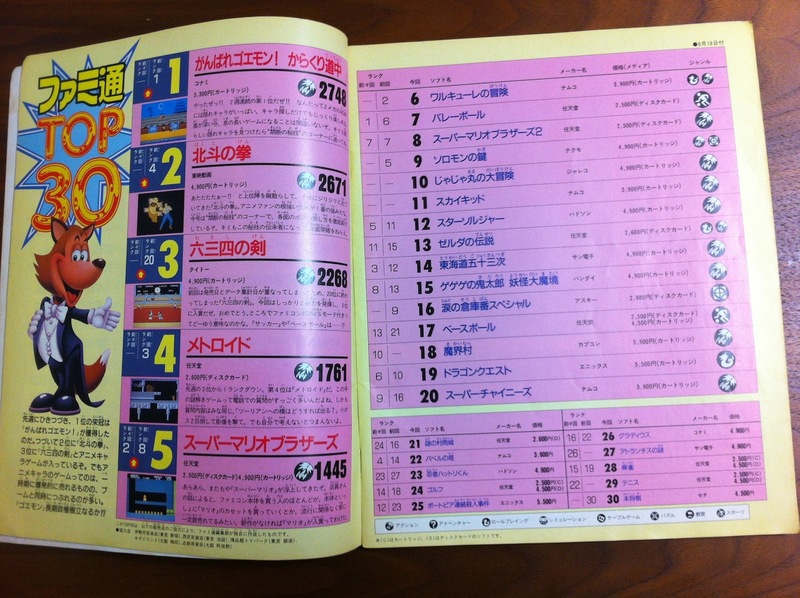 I'll post tomorrow the rankings for 1986 issues, we've found the correct dates for almost everything. There is some uncertainity only for second half of 1987 with some double issues. 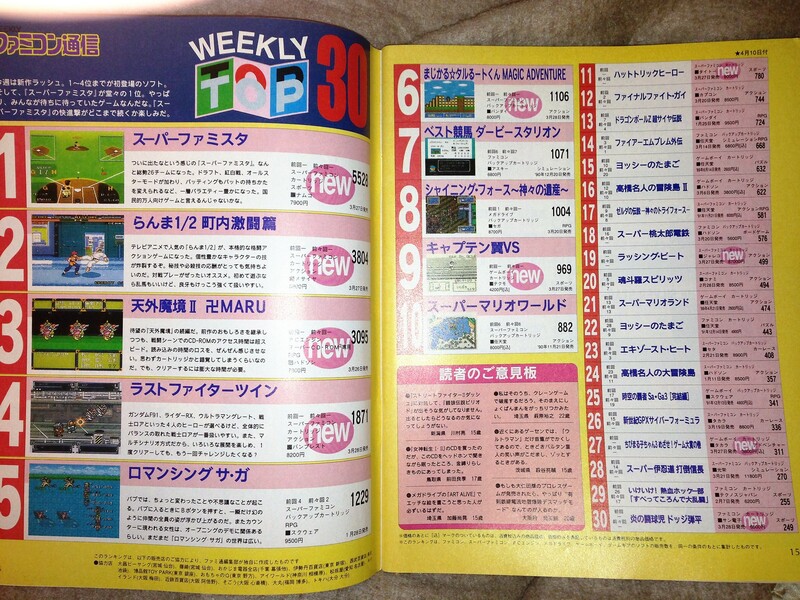 Thanks guys, I'll update the Famitsu post with the new charts soon. It's dead, has it moved to a new address , or is it lost forever? Anyone save the actual charts? It's dead, just like gamedatamuseum. Thanks, but I don't think you saved the actual charts. It's my own fault, my only hope is the Chris recorded chart positions in his database and we can reconstruct the charts from that, but probably not. Anyway, happy new year guys. 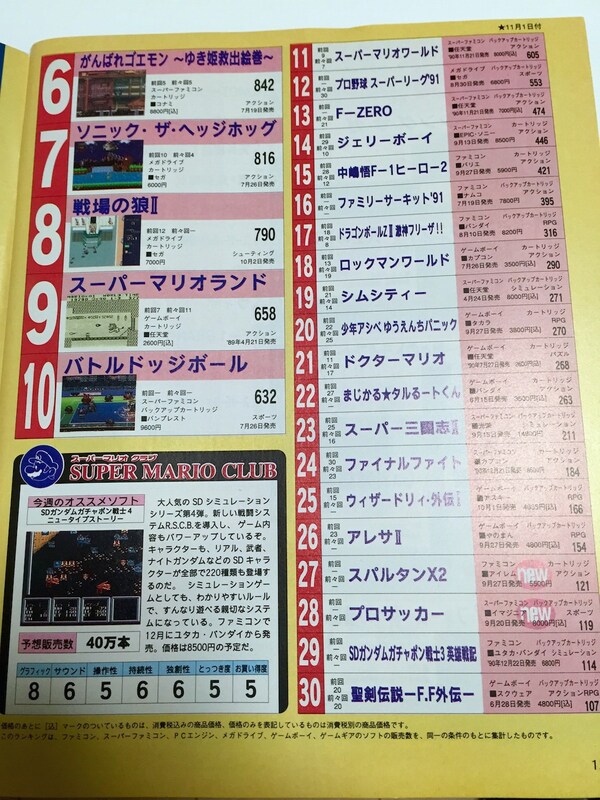 This from the SNES Collector's thread, it's new sales data for the SFC. 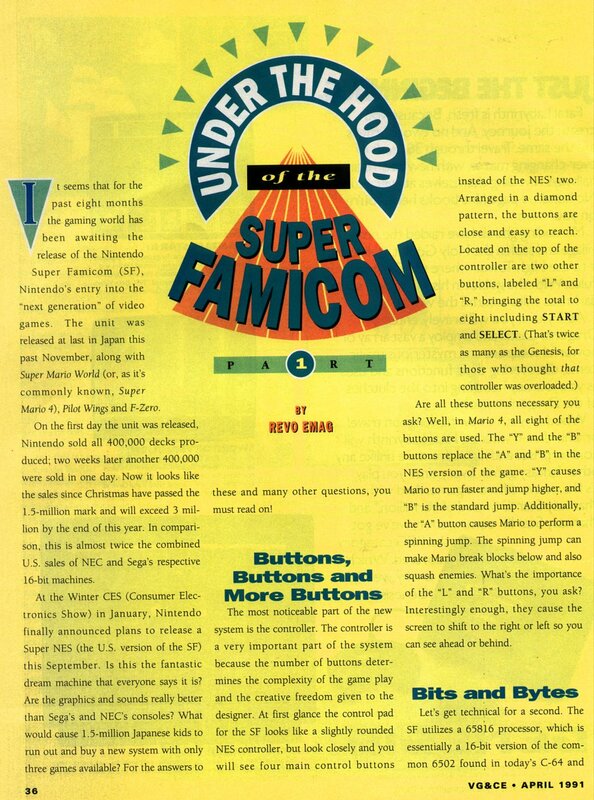 From the magazine "VideoGames & Computer Entertainment" April 1991 issue. Mentions SFC selling 400k first day and then 400k more two weeks later (also in one day). As far as I know the only info on SFC launch window data was the notorious 300k shipped out (in secret) on day 1 from the "Game Over" book. And nothing after until the fiscal March (1991) report which had 1.44m shipped to retailers. What do you guys think of the validity of this data? Also brings to light how little sales data we have right after launch of the SFC. 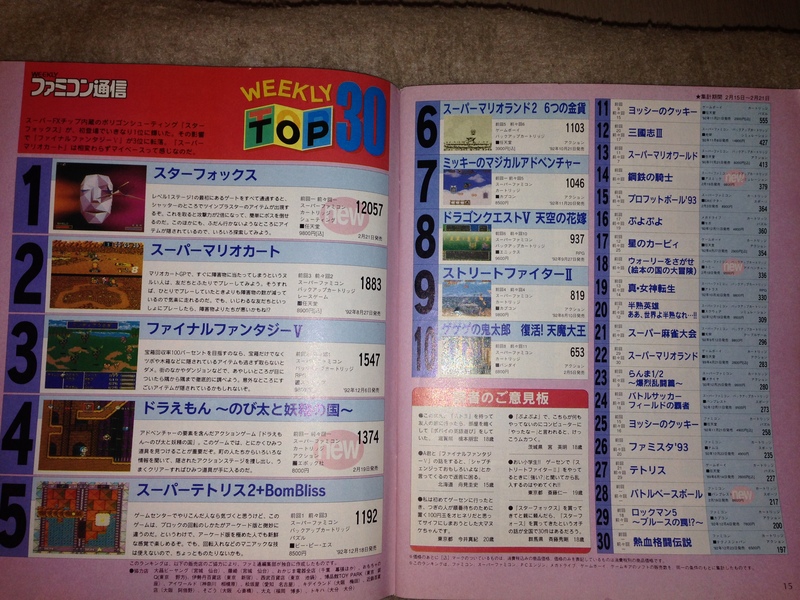 This is from a 1987 Famitsu issue, it has first week sales of Dragon Quest II. We barely have anything from 87 data, including any but LTD sales of DQII, now we have first week sales for the whole series. Does anyone know how much Sonic sold in Japan? This site is still banned on GAF (which is why you typed it with an additional space) for its poor methodology and wild inaccuracies when compared with data from actual professional sales research companies. I wouldn't buy any 'info' that comes from it. There's a reason why it's banned, after all. [EDIT] The site doesn't even cite its sources, and people in the comments of that page seem to indicate that the numbers are inaccurate/outdated (shocking, I know). You're welcome. It's a shame that market research companies have been leaving a hole - and, arguably, digging deeper, see the evolution of NPD data on GAF - for shameless websites like VGC to fill it with quasi-fake data. As many know by now, VG Chartz is unreliable (and I just realized even the site's name itself is censored here). 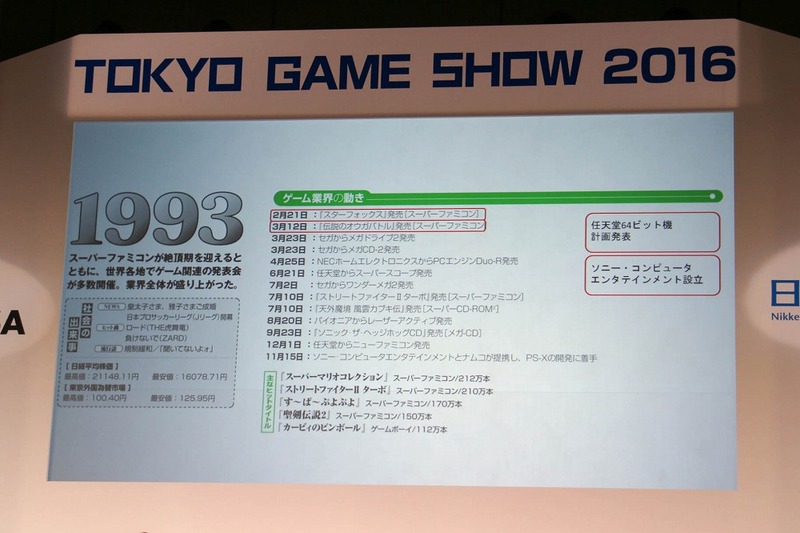 I meant Japanese sales figures from reliable sources (such as Media Create or Famitsu, for example). Does anyone have any numbers like that for Sonic in Japan? As far as I'm aware, Sonic didn't have much success in Japan. But it would be nice to see some actual sales figures for confirmation, and see how much it managed to do in Japan.